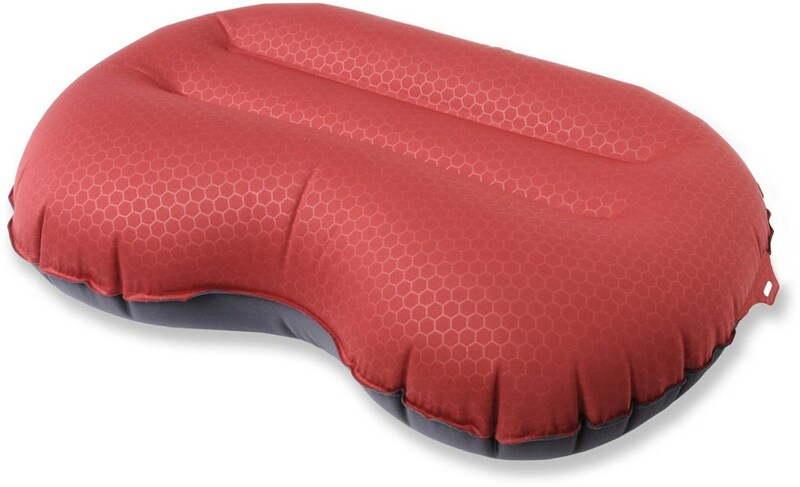 The Exped ComfortFoam Pillow is a great backcountry pillow. 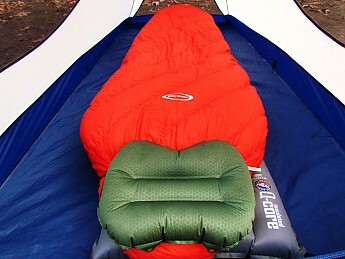 One of the most important elements of backpacking for me is to be comfortable when I am sleeping. This pillow certainly helps me have a good night's sleep because it is so comfortable! 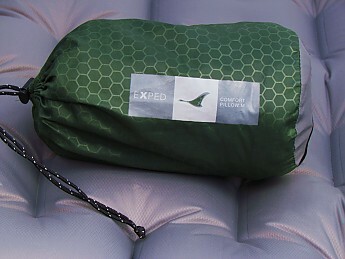 After lots of research, I found that the Exped Comfortfoam Pillow was the right backpacking pillow for me. 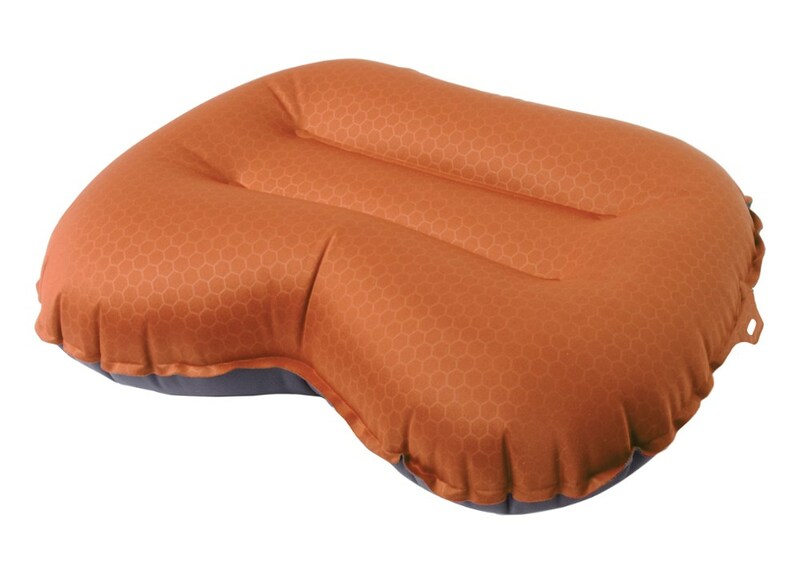 I read a lot of reviews and specs on several pillows and this one had the features that suited me the best. Of course I would rather it weigh 2-3oz, like some of the others that I looked at, but I am willing to sacrifice the extra weight for comfort. I am a side-sleeper, who usually uses two pillows at home. This pillow does not have the height that I am used to at home, so sometimes I place some folded clothes under my pad to go along with the pillow. I usually blow it up to about 3/4 full, so that it has a cradling effect. 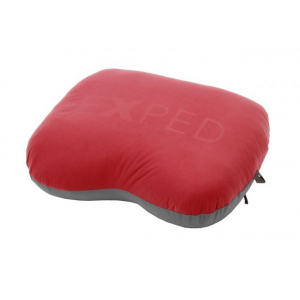 The Exped Comfortfoam pillow is insulated with pellets of high grade open cell polyurethane foam recylced from the production of other Exped mats. 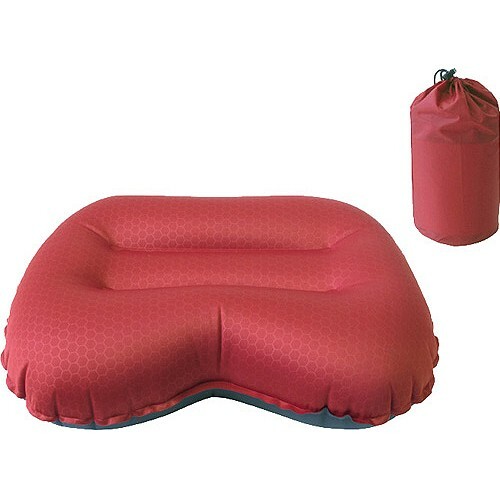 Other pillows that I researched either relied on air alone or down to fill the pillow. 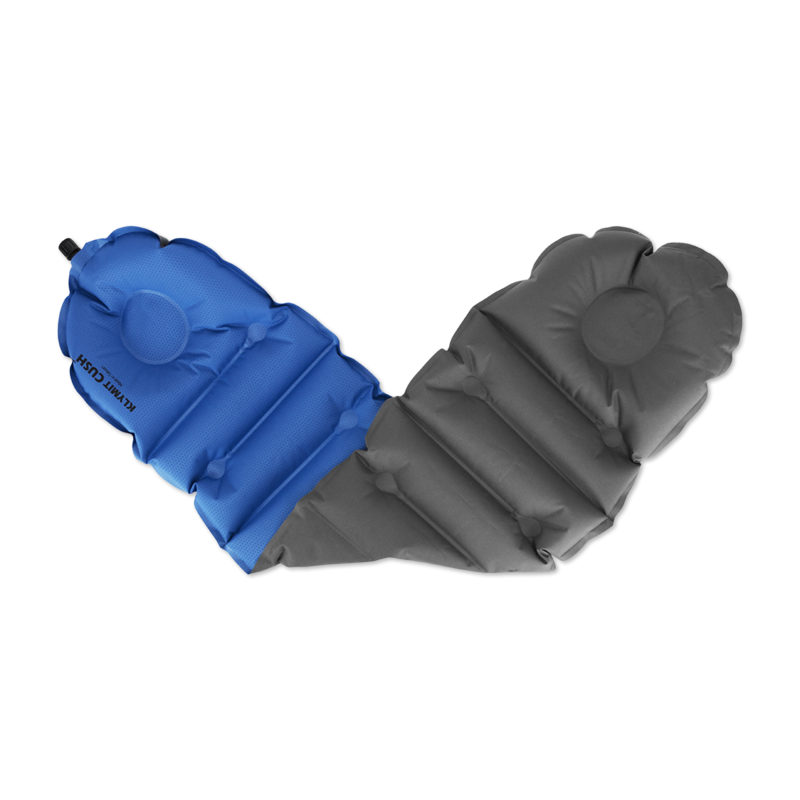 The ones with air alone weren't as comfortable and the ones with down weren't supportive enough (in my opinion.) The outer material, tricot polyester, is very soft. It is also very durable. I have had mine for about three years now and it has held up very well. It has had no tears or leaky valve problems so far! Here is the back of the pillow. 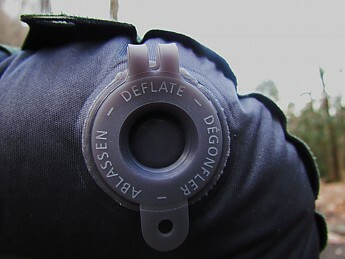 The inflate valve is on the left and the deflate valve is on the right. The two loops that you see at the top of the pillow are designed to allow pillow to be attached to Exped mats with corresponding loops. This prevents the pillow from sliding during the night. 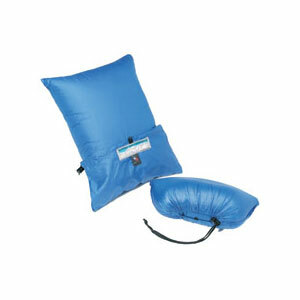 I have a Big Agnes pad, so these are useless to me. Inflation and deflation are a breeze. It takes 2-3 breaths to fill, depending on firmness. 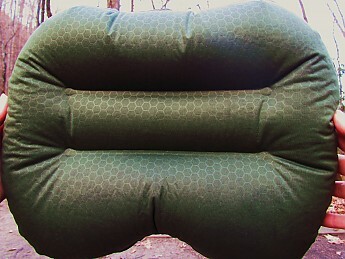 The adjustability is a very nice feature in this pillow. 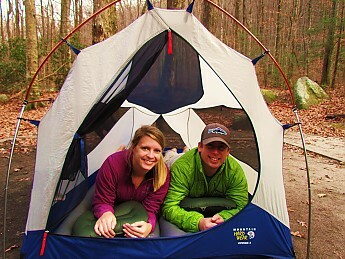 The Exped Comfortfoam Pillow is a staple of my sleep system! 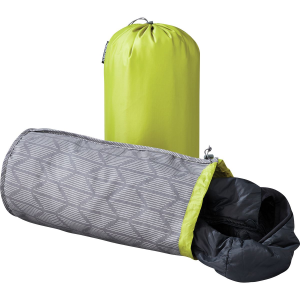 I am pretty sure that I have one of the most comfortable backcountry beds out there with the Big Agnes Insulated Q-Core, Montbell UL Spiral Down Hugger #1, and the Exped Comfortfoam Pillow. 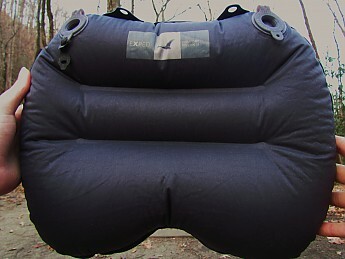 The Comfortfoam in its stuff sack. 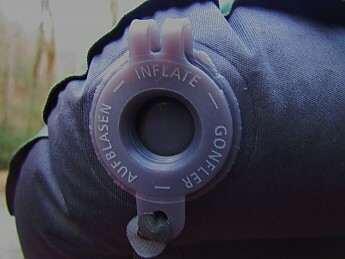 The Exped ComfortFoam Pillow is not available from the stores we monitor. It was last seen March 3, 2014	at REI.